My research into the costumes of Savoy has led to more material than I expected. 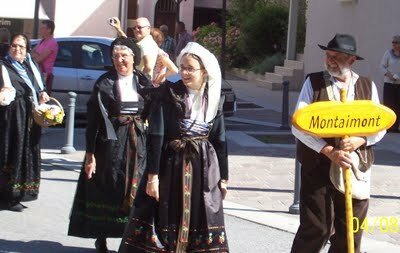 The costumes of the lower main valley of Maurienne are only slightly different from that of Orelle, which I covered in the last posting. 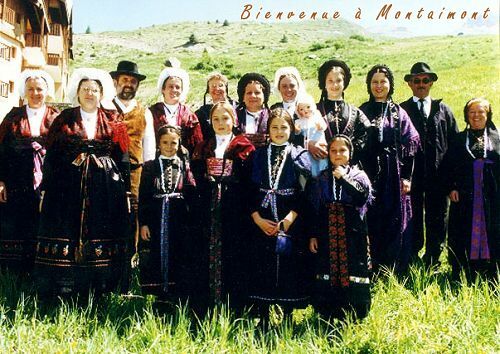 Today I will cover the costume of two side valleys of lower Maurienne, the costume of Montaimont in the Bugeon valley on the north side of the main valley, and the costume of the Villard valley on the south side,which joins the Arc at about the same place.You can see Montaimont and St. Colomban des Villards in the center of this map of the lower Maurienne. 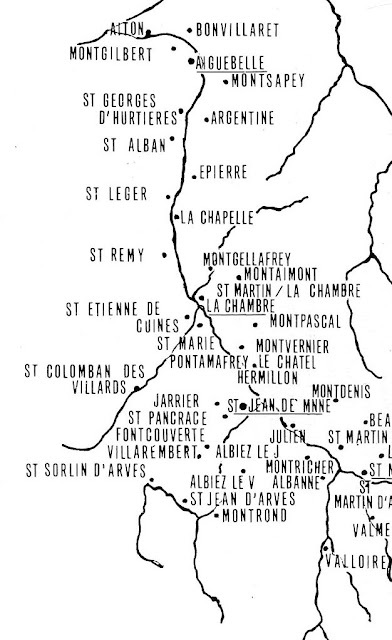 For a larger map of the area, see my posting introducing Savoy. This photograph was taken in 1920. 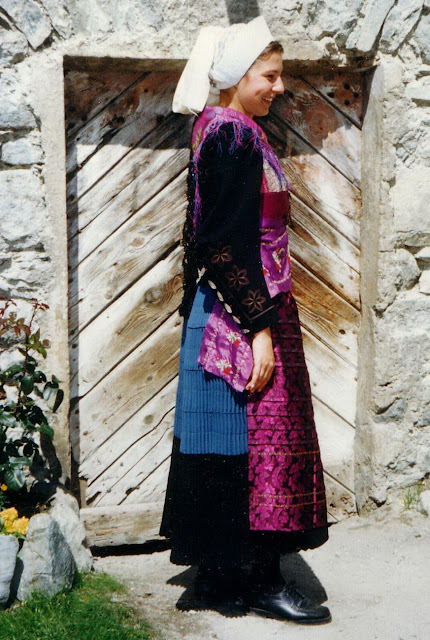 The dress is similar to that of most of Maurienne, except that the bodice is open and secured by ribbons laced through the edge. 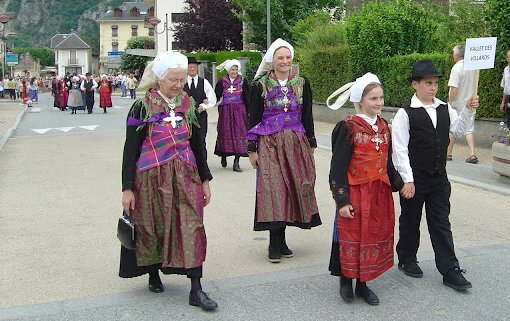 A dickey is worn underneath the bodice, resembling the plastron of Tarentaise, which is just over the mountains to the north. 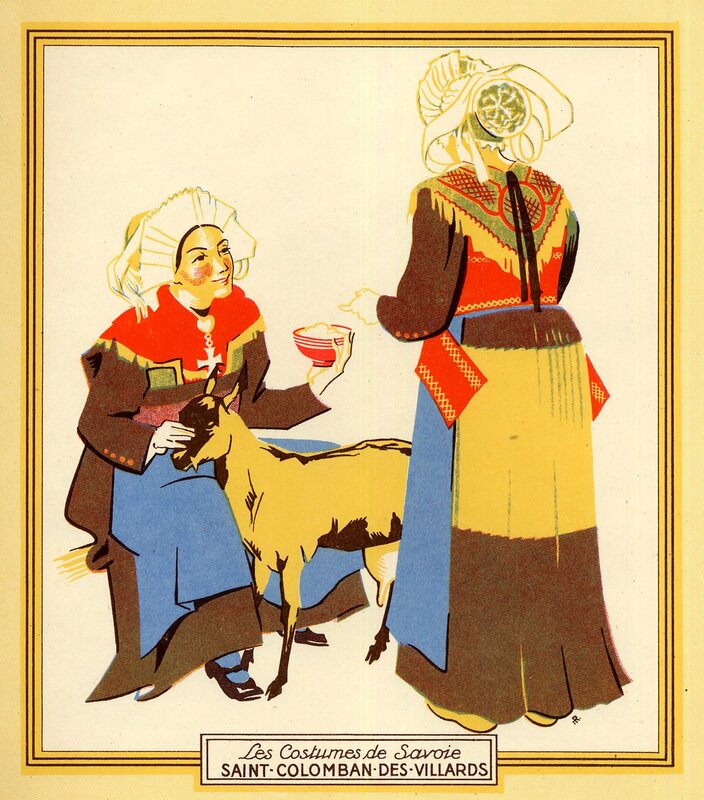 The coif is white, and of a type we have not seen before, similar only to the coif of the valley of Villards. Young girls wear a simpler costume, and as you can see, the men's costume is no longer worn. 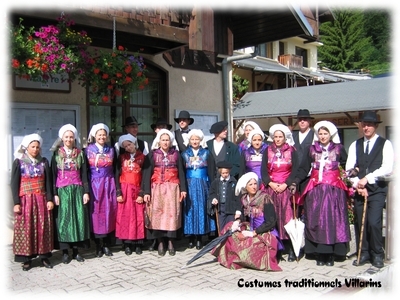 The best time to see costumes in Maurienne is on the feast of the 15th of August. 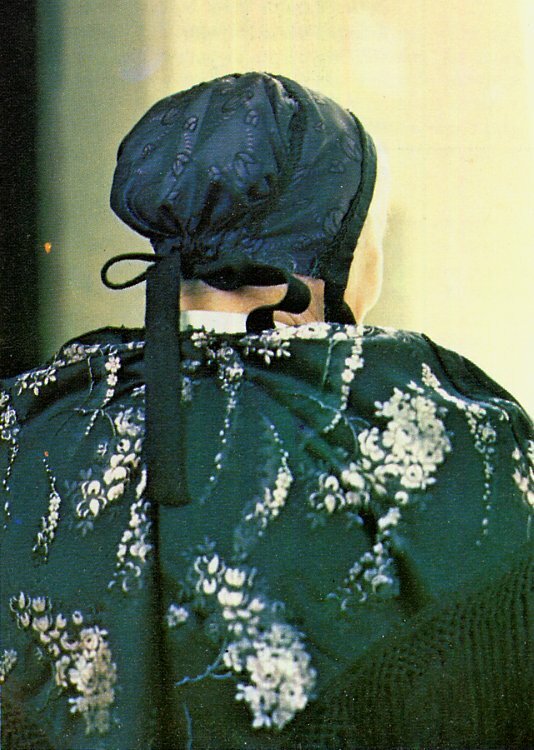 The fichu is pinned in three folds, and the daily coif is much simpler. 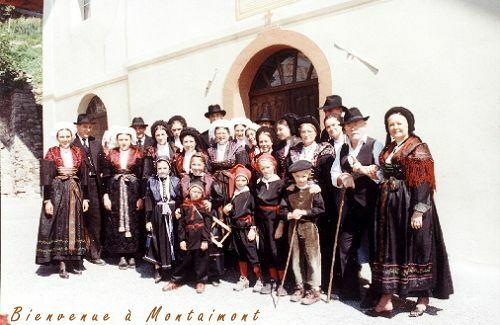 Just a few more images of the costume of Montaimont. 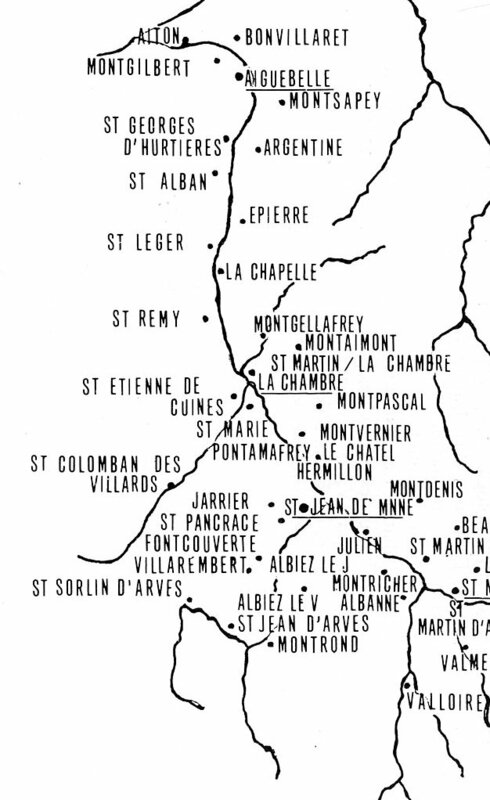 The Villard valley has two municipalities, St. Alban and St. Colomban. The second is much better known than the first. 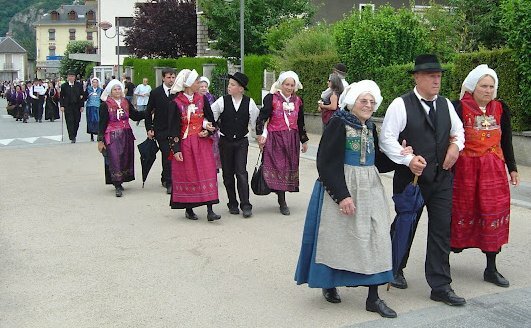 This costume is intermediate between those of Montaimont and the Arvan Valley. The coif greatly resembles that of Montaimont. 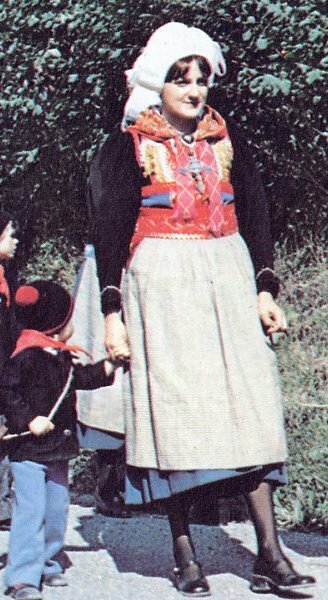 The jacket and skirt are separate in this valley. 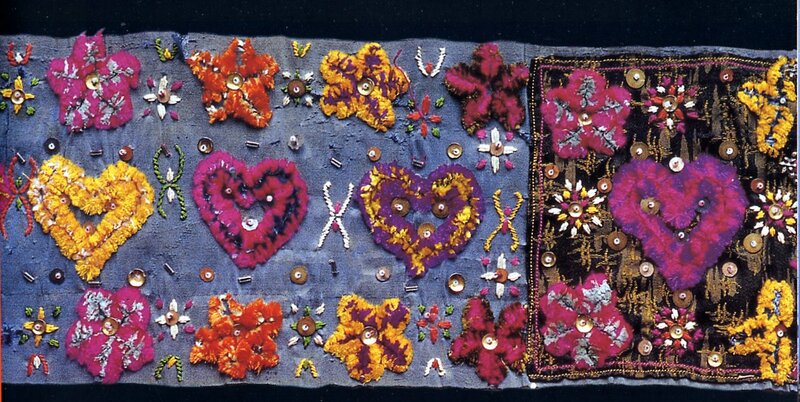 The jacket has ornamental buttons and embroidery on the sleeves. 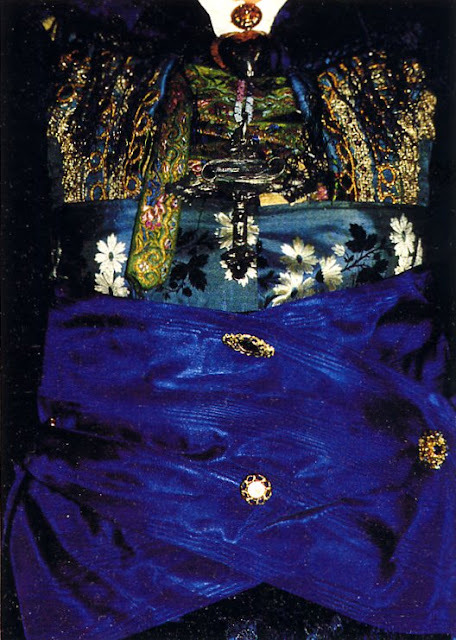 The jacket does not close, but is laced up with a ribbon or cord. Take a close look at the image above and this one. While the everday skirt is gathered, the festive skirt is made of black cloth with forty accordion pleats. 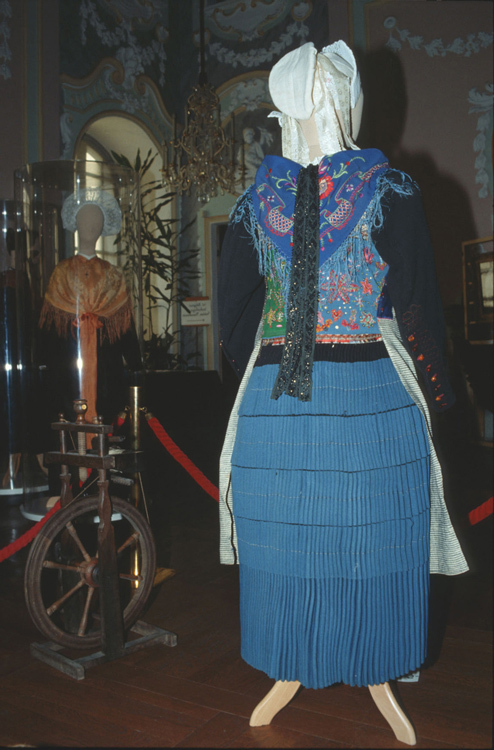 At some distance below the waist, four or eight strips of blue cloth are sewn onto the skirt. 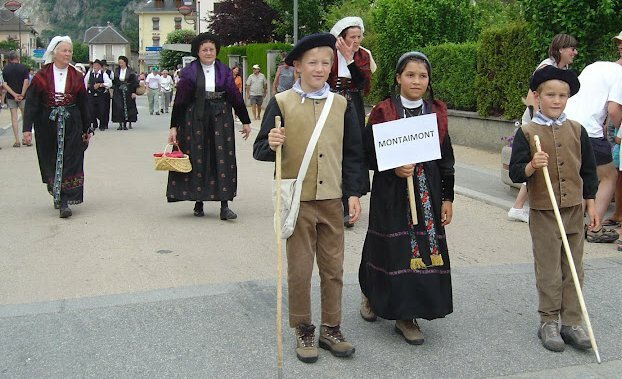 This skirt is somewhat shorter than in the rest of Maurienne. A precautionary note here, be careful of your sources. 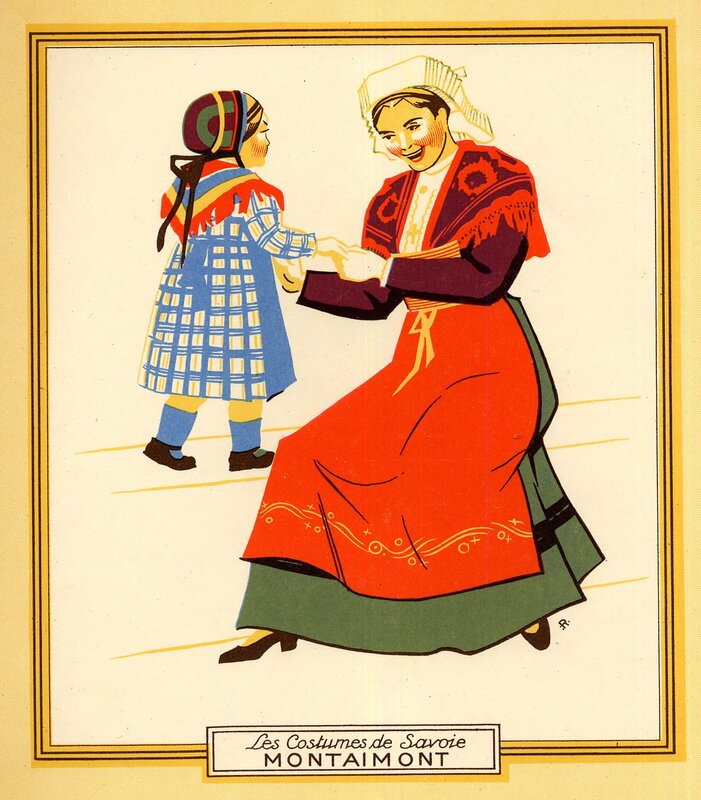 I have a set of very nice prints of the costumes of Savoy, but like many that were made early in the 20th century, they were drawn from black-and-white photographs, and so the colors were made up. The strips on the skirt are always blue. 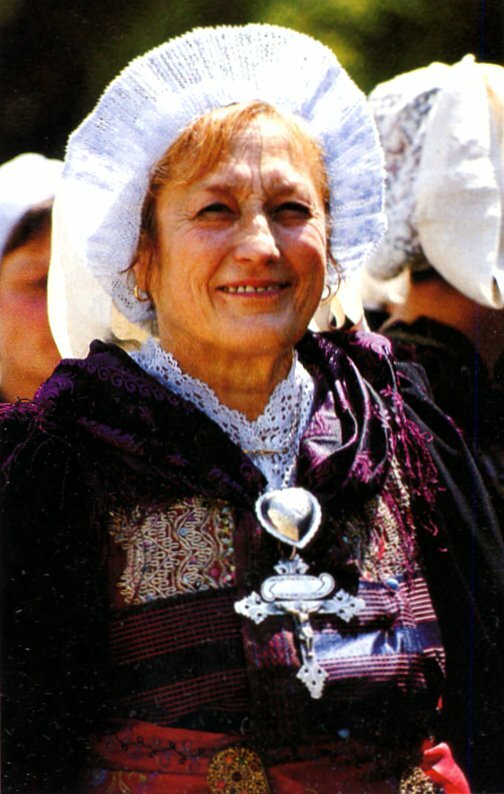 A wide cincture is worn with this costume. 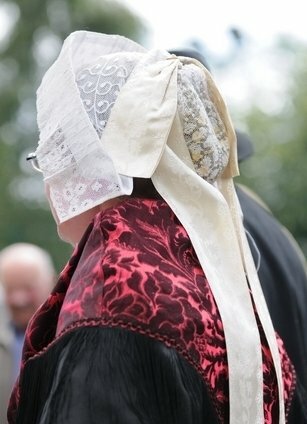 It lies under the wide band of the apron, and over the bottom edge of the jacket The edges of the jacket are ornamented. 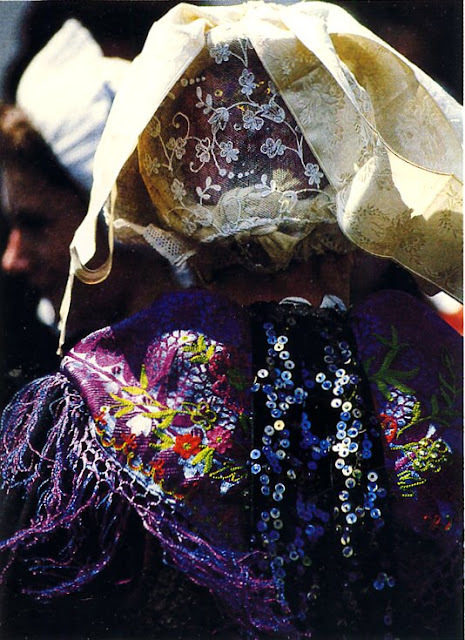 The normal cincture is embroidered for more festive occasions. For the most festive version of the costume, a large silk sash is wrapped around from behind, and pinned with a few brooches so that the ends hang down on the front of the apron. 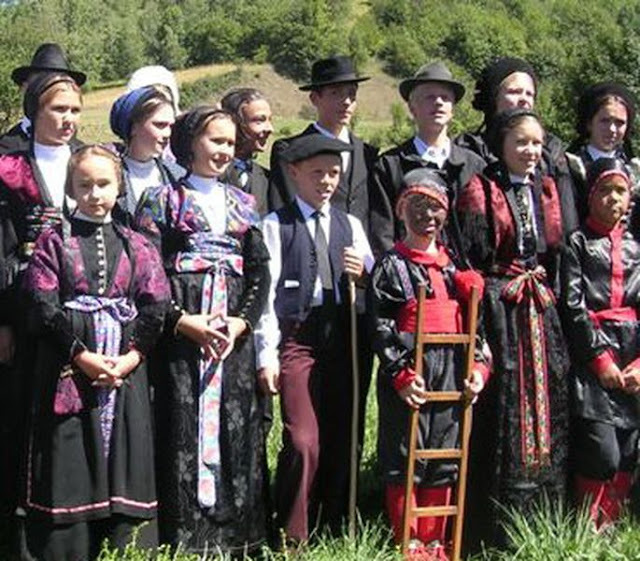 As in other parts of Savoy, a large cross is an integral part of the costume. 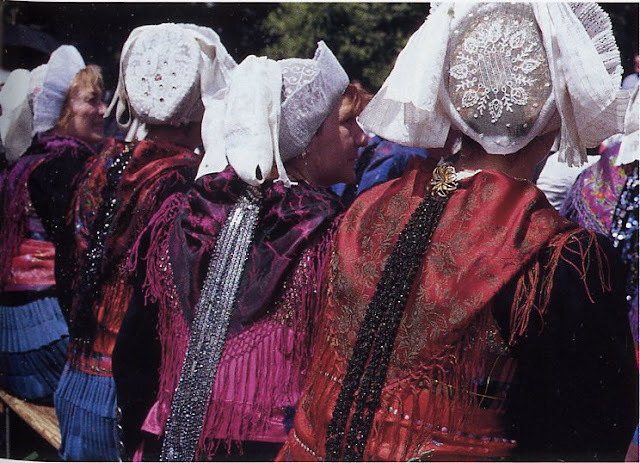 There are ribbons hanging down the back over the shawl, sometimes beaded, which are called the 'flats'. To finish, just a few more views of this costume. Hello! Your blog is very informative. I learned many things here. I'm very glad that someone decided to create folklore related blog. 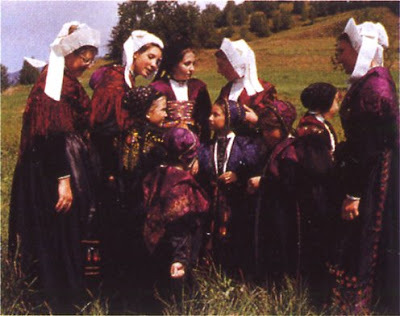 Especially about folk costumes. When are going to do a research into Polish folk costumes? So far you haven't written much about them. I am enjoying myself doing this. I have written a few postings on Polish costume, mostly those along the eastern border,and not 'typically' Polish, as it were. I guess that I feel that they are well known. I will certainly write more. Is there any particular region that you are interested in? I am jumping around deliberately so as to create variety, but i fully intend to cover as much as i can. Researching Savoy has taught me a lot that i did not previously know. I am only planning one more posting on Savoy, for now, and there are countries which I have not written about at all yet. If you have a particular region that you are interested in, I would be glad to research it. In general I'm interested in many Polish regions... and not only Polish. Anyway if you ask, I can say, I'm mostly interested in Kashubia, Upper Silesia and Sieradz area. Your researches are very good and accurate. 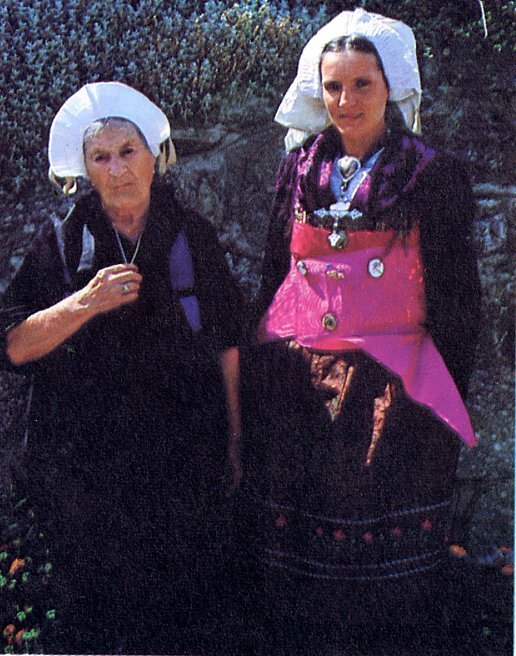 So far, I haven't read on the Internet more informative articles about folk costumes than yours. It's interesting, especially when you write about "unpopular" places like Tatarstan etc. 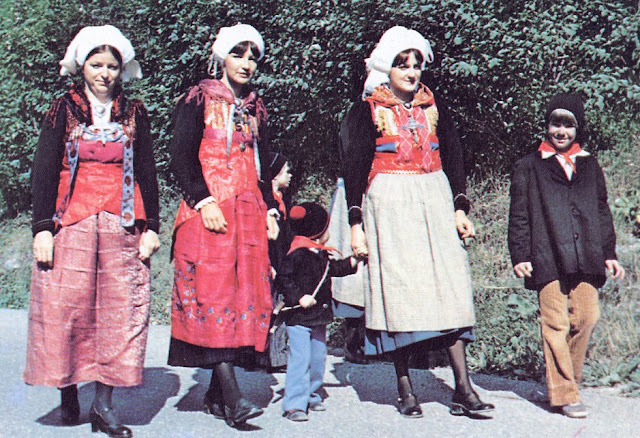 I'd like to put in a vote for more Polish Costumes! But also any Eastern European. I am looking forward to reading the Central Serbia one - I haven't got up to it yet as I haven't been reading for a while! 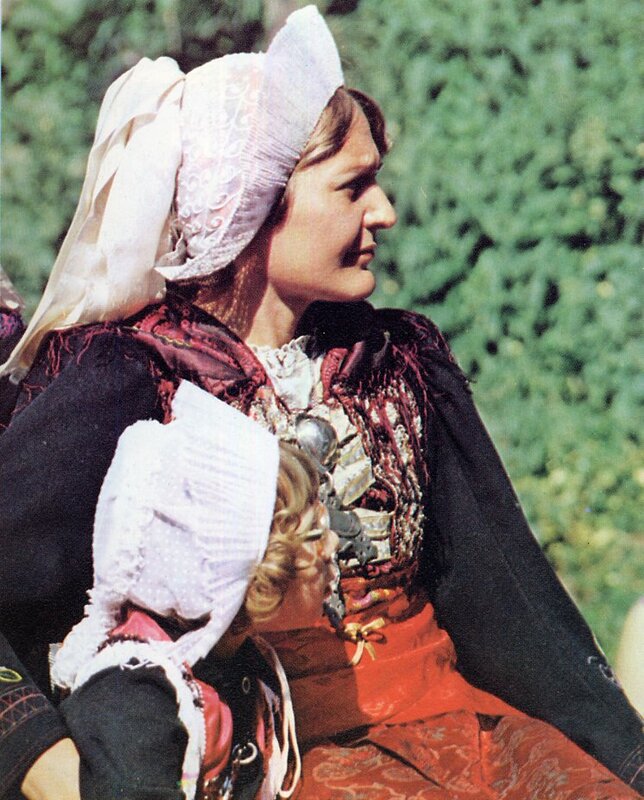 In one of your Polish articles, there was a picture where you said one of the woman was dressed in the 18th century style. 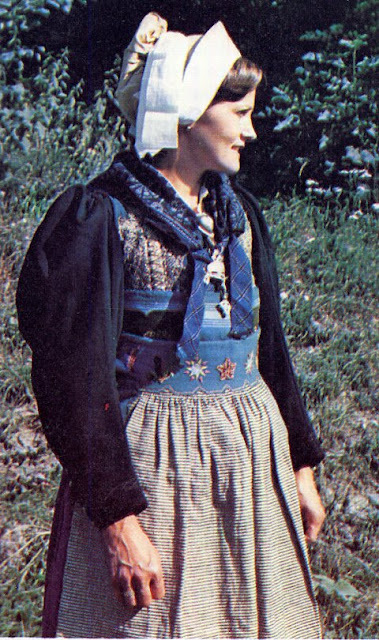 I think you said you would discuss it more "later" - if you do get more information on the older Polish folk/peasant styles, that would be fascinating. I more more interested in the common clothes than the folk costumes, but yours is the only website I've found that provides such good information and so much of it on the lesser known European clothing, so I really appreciate all your research and the work you put in. Oh yeah - I also really like the garment pattern diagrams when they are available! Yes, there are many subjects which i intend to get back to, lol, i need to start keeping track of them. By 'common clothes' I assume you mean city clothing. What i cover in my articles is indeed the common clothing of each area. I admit that the history of city fashion is something which i have little interest in. 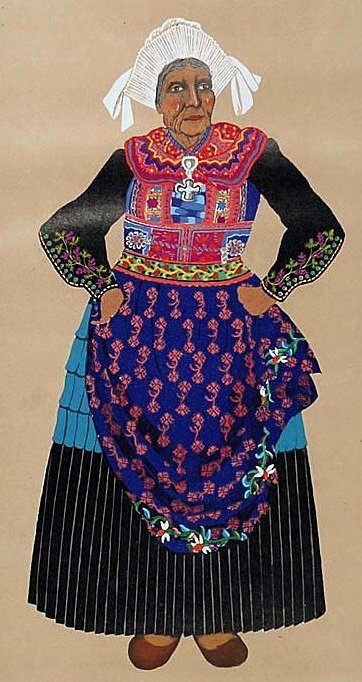 But there are many people who do write about it, and there is definite influence on local costumes of various areas. 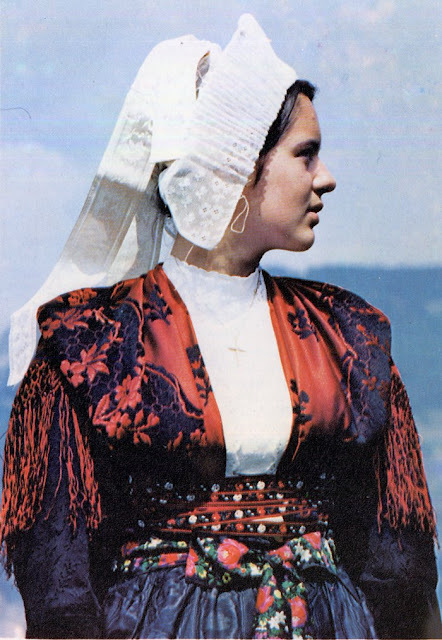 I find the general world of fashion far too uniform, unimaginative and lacking in the kind of individual expression and artistic endeavor which one finds in local costume traditions, especially in the modern world, but that is just my opinion. Of course, there is historic change in peasant clothing as well, but since textiles are rather ephemeral, and people who wrote things down in general tended to ignore the common people, there is often little material to work with. If you could remind me which of the Polish costumes you are referring to, I will take a look at it. 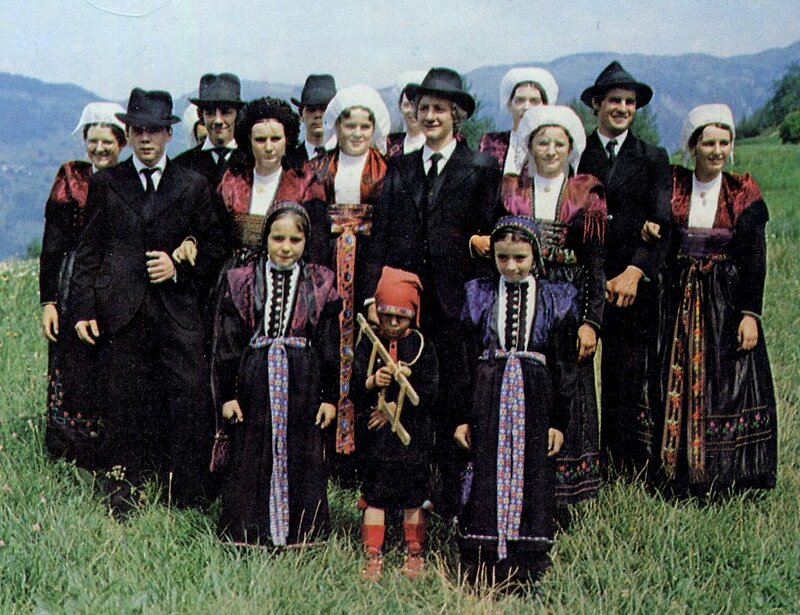 It is true that so far i have been talking about the costumes on the eastern fringe of Poland. There is so much yet to cover!